Currently in use for score display at the National Bowling Stadium in Reno, Nevada: This device digitizes two independently asynchronous color video streams in real time and simultaneously displays a composite high resolution image whose pixel parameters are programmable without image interruption. This device uses an Intel processor. This device was designed to fit a pre-existing enclosure and connect to a proprietary bus. This fully custom desktop device intercepts system command strings and alerts the operator with specific prerecorded sounds when certain conditions are detected This product was designed with PLD’s, rather than a processor. These device remain in operation at Amtrak. The purpose of this production unit remains confidential, but involved the rapid design of custom power RF transformers and conduits to meet the very tight size specification. The unit allows for modulated and digitally controlled output power. This device, marketed as an internet based fax interceptor/receiver and re-router uses an Intel embedded processor and incorporates the design of a custom miniaturized Public Switched Telephone Network (PSTN) simulator with ringer circuit and enhanced features along with an integrated LCD controller and special analog circuitry. This device accepts standard memory modules for memory expansion. This device was designed before the advent of the PCI bus to affordably solve the industrial need to independently control multiple VGA monitors with a single computer installation. Numerous EL driver designs including those targeted for ASIC integration and discrete based solutions. These would include lamp age and color compensation circuitry, the automotive and consumer industries as well as custom magnetics designs. 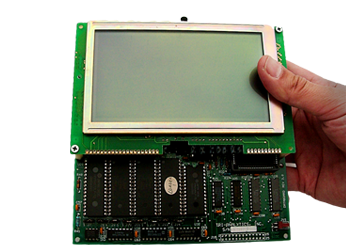 This design was a forerunner to the Apple Newton and included a touch-screen over a graphic LCD and boasted long battery life and natural handwriting recognition (This software was produced by my client). This product used an Intel micro-controller. The mechanical design was also my responsibility. This product required the design of a special high voltage, power, and high frequency switching supply and custom magnetics. This product, being released now, meets very tight power and size requirements and includes 10/100 Ethernet hardware and an innovative TDR subcircuit. This product required the design of a low out-gassing, narrow-band, FM, RF transmitter, fed by a digital Gaussian modulator at a minimum payload burden for launch into space. This device uses digital voice synthesis and computer control to auto-signal the “call” ID of an RF radio repeater. This device incorporated a CPLD and micro-controller timing solution and S-Video and Composite Video outputs for two independent video channels. The proprietary digital interface prevented interference with other video cards in the system. This product was designed without proprietary ASIC devices. This device made use of the Intel Controller Area Network (CAN) bus devices and Intel processors for the control of numerous robotic systems. This device, powered entirely by the voltage levels available from the POTS line (plain old telephone signal), responds to user input and sensing and automatically dials as needed. This special water softener controller allows a new tank system to operate continu-ously without time out for regeneration. This device was developed in conjunction to our client’s patented filter system as a portable safeguard against anthrax poisoning. This device would unobtrusively measure AC load current. This device is a patented exciter capable of producing a multiplicity of simultaneously modulated carriers using both AM and FM modulation.